Our next "Tales from the Lines," is a lovely yarn from, appropriately enough, the 1967 Royal Tornament at Earls Court, passed to me by one of the participants. "I posted a while back about our exploits at the Earls Court Royal Tournament in 1967 where all the pipe bands of the Scottish Division took part. This was when the guys in the Cameronians found out 'officially' that they were to be "No More". Yes, grown men do cry. 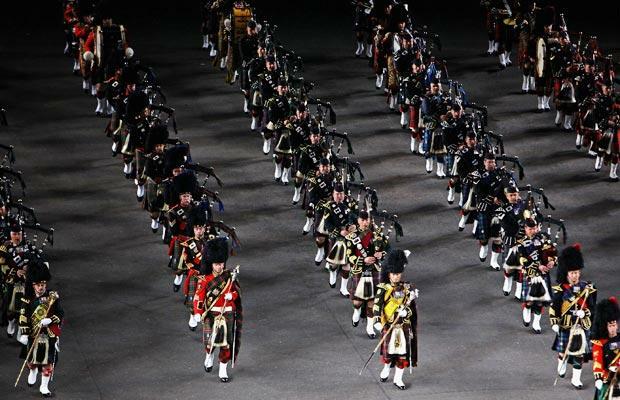 On the evening when Field Marshall Montgomery was taking the salute, unbeknown to the drum major or pipe majors, ALL the Scottish Regiment's pipe bands had decided to "mark the occasion" by playing the Cameronian Regimental march, The Athol Highlanders, instead of the 'normal,' (as per the programme), Scotland the Brave and the Black Bear, as a show of support for our good pals in the Cams Pipe band and Regiment who would be gone the following year. Well we did it, and when we stepped off at the end of our performance and marched past the saluting dias, we were marching at 140 paces to the minute so were hawfway oot the arena before old Monty got aff his erse to take the salute. Needless to say, he was NOT amused, and the senior Drum major and Pipe major were summoned forthwith and given a rolliking (remember, they knew nothing about it) until 240+ massed pipers and drummers were passing THEM on the arena on the way oot. So what, we had to go back on and do it again, PROPERLY. We had made our statement and it was our way of sticking two fingers up at the the establishment for getting rid of one of our own. Yes we suffered for it, but it was worth it and I will go to my grave with the memory of the old nutter hawfway oot his seat to take the salute and all he saluted was the back of our kilts swinging good style oot the arena. Funnily enough, we were never invited to take part again (as the Scottish Division), but once was enough." Incidentally, I wrote previously about the Cameronians and their emotional farewell. If you have never listened to the address to the 1st Bn by the Rev Dr Donald McDonald it's well worth doing so. One of the finest pieces of oratory I've ever heard.